Static Control | What is MICR Toner? Whether you realize it or not, MICR toner greatly impacted one major thing in your life - your wallet! Paycheck and personal checks in the United States and Canada use MICR toner to allow for machines to read the ink directly off the page. But what is MICR toner? MICR is an acronym that stands for Magnetic Ink Character Recognition. It is the process used to create machine readable information on documents. When you think of your checks, recall the numbers at the bottom that include your account number and other pertinent information. This is the line written in MICR toner or ink that is used to process checks. 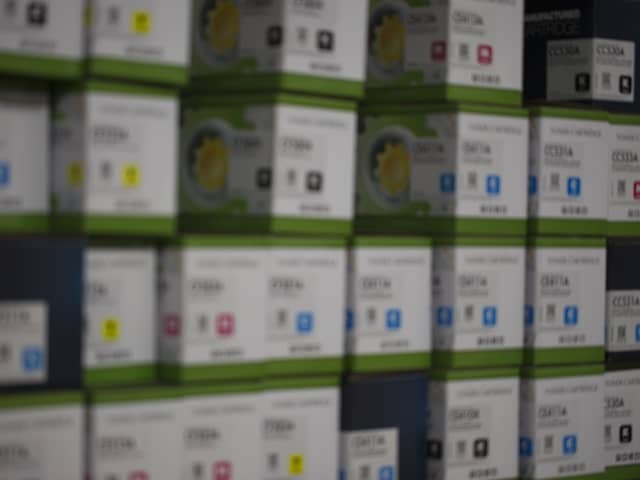 Each check that is deposited is read and sorted multiple times by high-speed machines, so the dependability of the toner inside the cartridge is critical to the efficiency of the process. The toner placed in each cartridge is the crucial part of the encoding, reading and sorting of checks and other documents. Our MICR toner cartridges are guaranteed to produce MICR-encoded checks readable by financial institutions, the Federal Reserve System, and the Canadian Payments Association. Technically, MICR is an acronym and therefore should be spelled out (M, I, C, R). However, we have it on good authority that despite it being pronounced "micker" in the movie Catch Me If You Can (starring Leonardo DiCaprio and Tom Hanks, based on the book about Frank W. Abagnale), industry insiders most commonly pronounce it "my-ker". MICR toners have more performance requirements to meet than other toners. In addition to the rigorous quality control testing all Static Control toners must pass, our MICR toner cartridges must achieve consistent signal strength during the entire run of the cartridge. A machine is used to test that the toner is within ANSI specifications. The qualifier reads the character waveforms and looks for an average signal strength for the entire check. The accepted U.S. range for this average is 50%-200% of nominal. We narrow that range to 80%-175% and average 125% to give you a MICR toner you can depend on for uniform performance. This signal strength range also meets Canadian 006 MICR Standards of 80% to 200% signal strength. Abrasive tests are run with a high-speed reader-sorter machine to test for low reject rates through multiple passes. Quality check paper and the correct fonts are used throughout the testing process. Finally, statistical sampling and testing of each lot of toner ensures that you receive a reliable cartridge filled with MICR toner. Static Control has been an industry leader in providing MICR solutions for more than two decades. Our line of MICR cartridges is always continually expanding. Our most recent releases include MICR replacements for HP® CC364A/X, CE390X, CE505A/X, CF280/81A, CF280/81X, CF255A/X, CF287A/X cartridges. Contact us today to learn more about our MICR toner cartridge solutions. DÜRFEN WIR IHNEN EINE ZUVERLÄSSIGERE ERSATZKARTUSCHE VORSTELLEN? © Static Control Components, Inc. Alle Rechte weltweit vorbehalten. Wir verwenden auf dieser Website Cookies, um Ihre Erfahrung zu verbessern. Indem Sie unserer Verwendung von Cookies zustimmen, erhalten Sie die bestmögliche Erfahrung und ermöglichen fortlaufend Verbesserungen.